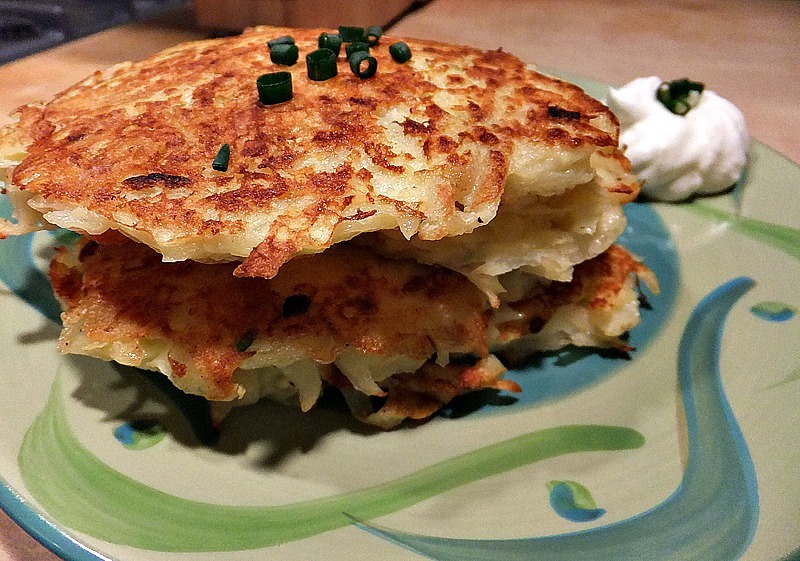 These potato pancakes are starchy, cheesy, and buttery. It’s not the type of food I try to cook on a regular basis. However, the other day I was watching the Food Network with my youngest daughter when they showed a recipe for potato pancakes. She said “When are you going to make those again? Yours are the best in the world”. How could I refuse? Beat the cream cheese and eggs together in a large bowl. Add flour, salt, black pepper and cayenne pepper and beat well. Add the shredded potatoes, Swiss cheese, and green onion to the cream cheese mixture. Chop, chop. 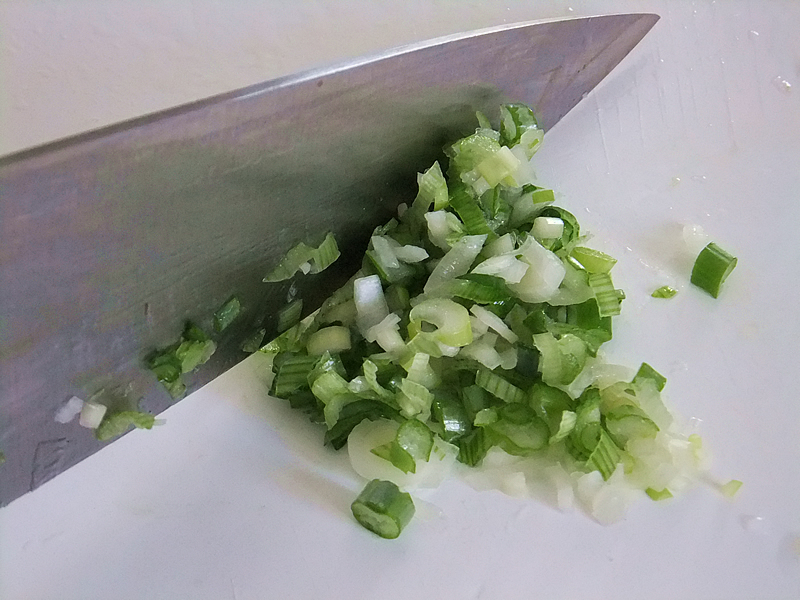 Keep chopping until finely diced. Stir the potato mixture together well. Spray a large non-stick pan or electric griddle with non stick cooking spray and add a few pats of butter, heat to medium. 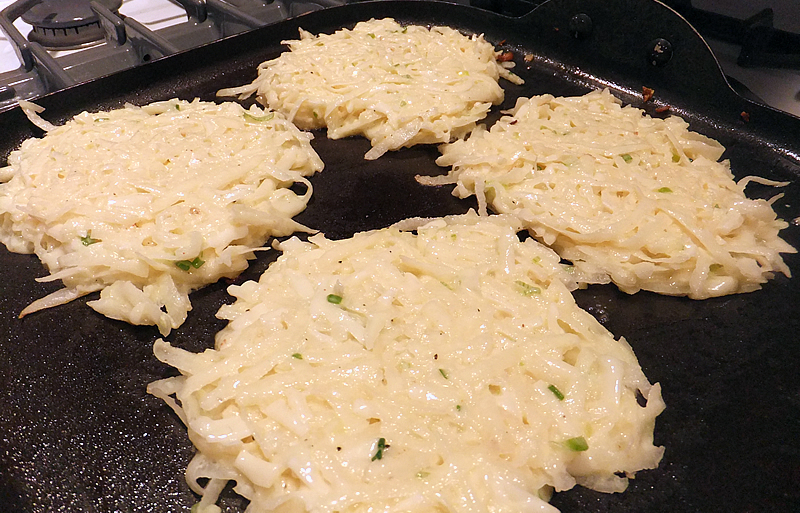 Drop the potato mixture onto the griddle by heaping 1/4 cupfuls. Flatten the mixture down well so you don’t end up with raw potatoes in the middle. Cook about 5 minutes per side or until golden brown. These pancakes are quite versatile. Serve them for breakfast, as a hearty side dish, or as a meal on their own. Don’t forget the sour cream! I really appreciate your comments, thank you! My kids really like these, and they are quite substantial, so I usually serve them alone or with a mixed green salad. If you served them as a side, roasted or baked chicken would be a good idea since the potato pancakes are a bit labor intensive. A side of sausage or bacon is great with these, too. 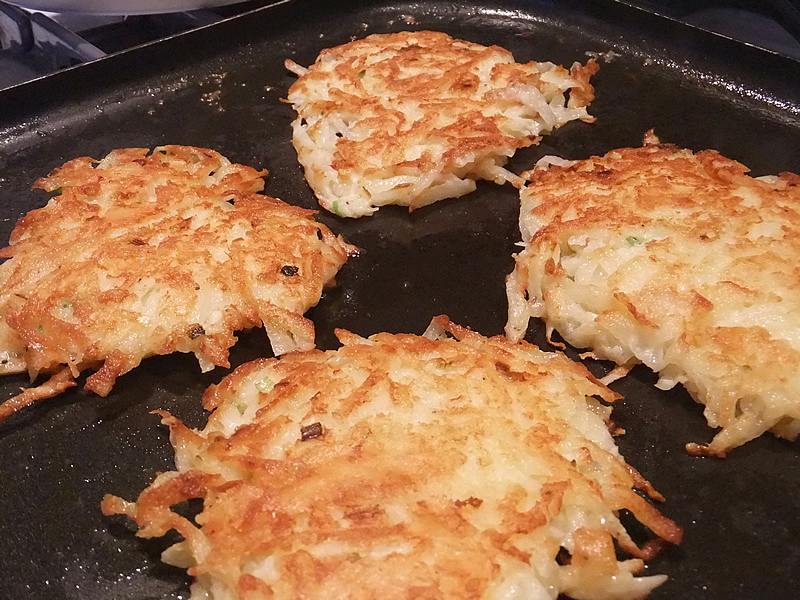 Your Swiss Cheese Potato Pancakes look delicious and I could see using them as a side for any special meal, including breakfast (with eggs, toast, fruit). Thank you for sharing. I can’t wait to make them.